Microsoft and the NBA's "chosen one," LeBron James, are dropping a marketing relationship that had the Cleveland Cavaliers star forward hawking Windows Vista and promoting himself on an MSN site, Bloomberg reported. "James' spokesman Keith Estabrook confirmed Wednesday the contract between the Cleveland Cavaliers All-Star and Microsoft is not being renewed," according to Bloomberg. "...The partnership faltered when Microsoft executive Joanne Bradford, who struck the deal with James, resigned as head of the company's media network this year." 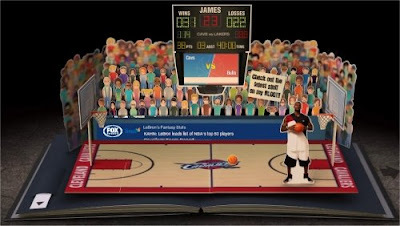 In Februrary 2007, Microsoft's MSN group announced a Web site, lebron.msn.com, to promote James' off-court persona and help him connect with fans. It featured content focusing on his rise to NBA stardom and sports statistics, but also his involvement with the community. Just visited that Web address and, sure enough: "The site you have requested has concluded publication."